Pocket CD (20 discs) cloth E20 Gray. Model: Pocket CD (20 / pcs) cloth E20 Gray. This product was added to our catalog on Saturday 30 March, 2013. Pen burn CD (3 Shaft) assorted colors. Pen burn CD (10 handle) red. Pocket CD (80 discs) Disney DSN1380 melt. 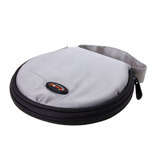 Notify me of updates to Pocket CD (20 discs) cloth E20 Gray.